Republican Sally Siegrist (left) and Democrat Chris Campbell (right) shake hands after their match. The race for State House District 26 started this summer with surprising vitriol. In June, incumbent Republican Representative Sally Siegrist sent a tweet criticizing her opponent, audiologist and West Lafayette Redevelopment Commission member Chris Campbell. It accused Campbell of not being involved enough in the community and starting a negative campaign. The message stood in stark contrast to Siegrist’s first run for state office two years ago – a race lauded for its quiet civility on both sides – and caused Siegrist to block reporters on Twitter. 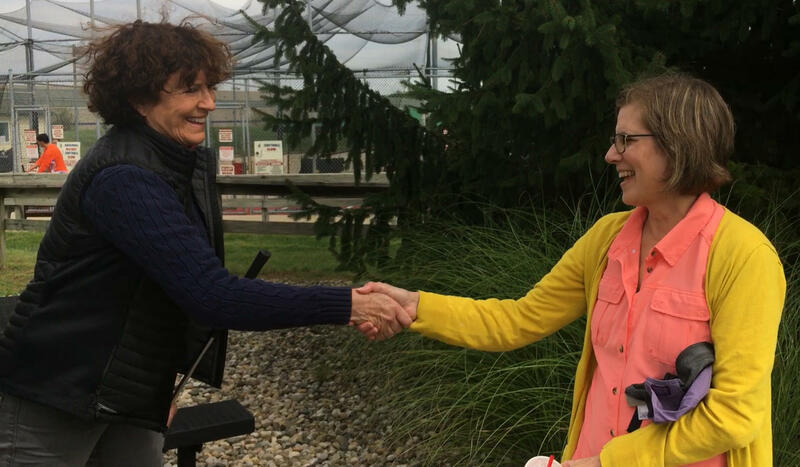 But when the two met on the miniature golf course, Siegrist seemed to go out of her way to be nice to Campbell, even fist-bumping her after one nice shot and deferring to let Campbell be the first to answer a question, despite winning a coin flip. Siegrist responded with a common Republican talking point – that education still makes up the biggest chunk of the state’s budget. She says she wants to focus on the state’s drug problem. On the topic of gerrymandering, which a 2017 Associated Press analysis found does favor Republicans by a few more legislative seats than statewide vote counts would suggest it should, both candidates were muted in their response, even though any changes to the way the state redistricts will likely be passed during the next two years (the duration of the winning candidate's term). Campbell says she’d like to take the politics out of the process. “I think that it needs to be a non-partisan way that really creates a good representation of the people that we’re going to be representing,” Campbell says. One area of agreement between the two seems to be the need for Indiana to shrink its wage gap – even though some conservatives, including former governor Mitch Daniels, deny a sizable one exists. “It’s important that we make sure that women who right now in Indiana have the next-to-largest wage gap compared to men, in Indiana. We need to address that issue,” Siegrist says. “Over the past six years or so, the increase in cost of living has gone up 31.9 percent, while our wages have gone up 6.1 percent,” Campbell says. Back on the course, Campbell won five holes, Siegrist won two and two were tied. 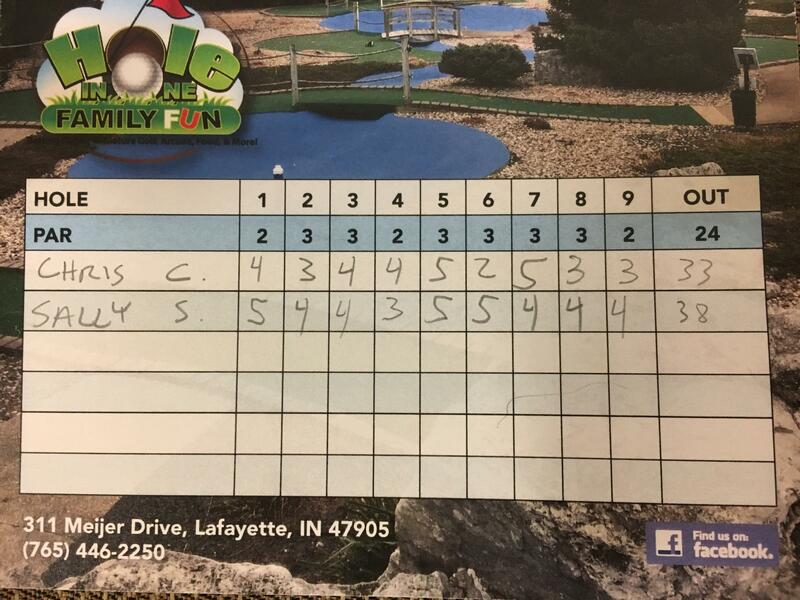 The scorecard from the House District 26 mini-golf match at Hole In One Family Fun in Lafayette. Both were quick to point out improvements they could make to their putting, and they had differing answers for the biggest problem lawmakers have had in recent years. Siegrist says the state is trying to solve the opioid crisis, but hasn’t had enough time. “We have tried to expedite the process of licensing and reciprocity for both teachers and health care providers, and mental health professionals coming from other states. But it just takes time,” the incumbent representative says. Campbell countered a Siegrist point about Indiana’s low unemployment rate by noting low-wage jobs are much more likely to be filled than high-paying ones. This was the only pre-election meeting between the two candidates. Siegrist’s camp, along with those of several other Republicans, would not agree to more than one joint public appearance this election cycle. And unlike in debates, where both sides find ways to argue they “won,” this pre-election competition had an official scorecard, which saw Campbell win by five strokes, 33 to Siegrist's 38. Early voting in Tippecanoe County begins Wednesday, October 10th. Election Day is November 6th. By virtue of a pre-match coin flip, Chris Campbell answered questions first on odd-numbered holes and Sally Siegrist answered questions first on even-numbered holes. Question 2: What do you bring to this race that your opponent does not? Question 3: How much emphasis should be put on eliminating gerrymandering in Indiana? Question 4: If you could make one change to the legislative process in Indiana, what would it be? Question 5: In a time where voters are worried about an increasing partisan divide, what would you do to close that gap? Question 6: What's been the biggest recent success and the biggest recent failure of the Indiana General Assembly? Question 7: What will you do to make sure citizens of District 26 get the most benefit from West Lafayette's current building boom? Question 8: What do you want to improve about yourself in the next two years that will, in turn, make District 26 better? Question 9: What do West Lafayette and District 26 need from the 2019 Indiana budget and how will you deliver on those needs?